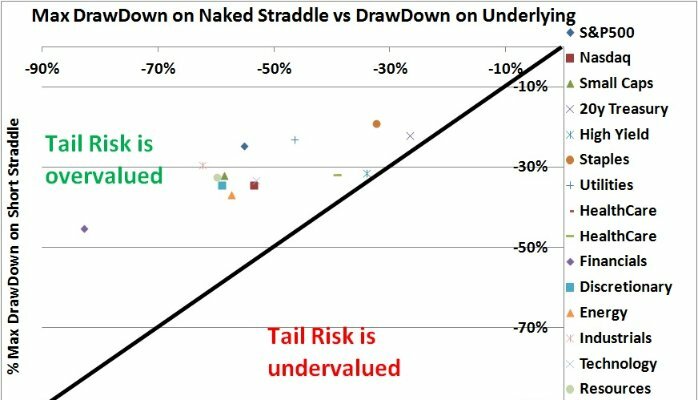 During past years I have found the great value in using implied and realized volatilities for volatility trading and quantitative investment strategies. The ability to stay focused and to follow quantitative models for investment decisions is what sets you apart in these volatile markets and contributes to your performance. The implied volatility from option prices typically overestimates the magnitude of extreme events across all assets – see the figure above The volatility risk-premia can indeed be earned using a quantitative model. Nevertheless, after many years of working on volatility models, I realize that there a lot of gaps and inconsistencies in existing models for measuring and trading volatility. Unsurprisingly, by designing a model that sets you apart from the existing ones, you can significantly improve the performance of your investment strategies. In workshop presentation at Global Derivatives Conference 2016 I have discussed in depth the volatility risk premia. The beginning and largest part of the presentation is devoted to measuring and estimating historical volatilities. The historical volatility is the key to many of the quantitative strategies, so that the historical volatility an important starting point in all applications. Then I discuss delta-hedging, transaction costs, and macro-risk management. Finally, I discuss using volatility for systematic investment strategies.